The secret to great web design for professional services firms is identifying the underlying firm personality and weaving this into our custom website design. Our experience and understanding leads to happy clients. Professional services website design covers a vast spectrum, ranging from law firms and consulting firms to banks and data analytics firms. In our web design experience reaching all the way back to 2003, Parachute Design has had many opportunities to work with and create engaging web designs for professional services companies of all shapes and sizes. What we’ve learned through this experience is that each firm is unique in its way. Identifying the underlying personality of the firm and weaving this into our best practices for professional services firm website design leads to successful website deployments and happy clients. 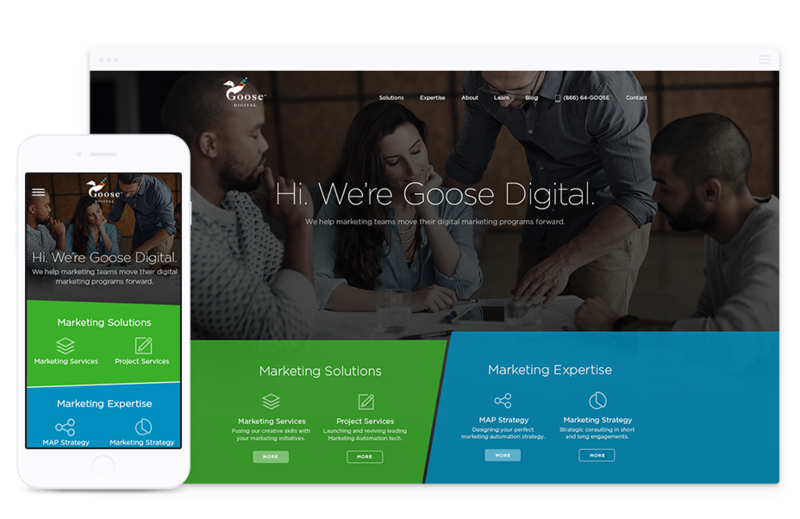 For an intimate look at some of our most recent website designs for professional services firms, you may be interested in our Goose Digital website design case study. Responsive design is a necessity for any professional service firm and is the foundation for all the best practices to follow. A professional services firm website design must be accessible and highly optimized for all modern devices for the firms content marketing and social media strategies to work. Offering a genuinely responsive web design experience to an audience of professionals instils confidence and trust in potential leads by ensuring the professional services firm is current and willing to invest in the future. Professional services firms like consulting firms, law firms and accounting firms all rely heavily on content marketing. The content or information is the sole reason most web users find themselves on a professional services firm website. Traffic is most often generated through organic search results or social media and offers an enticing snippet of information that could provide insight or gains to the user. As professional web designers, our job is to create a website design that can support this information and drive traffic through the website without distracting from the critical information. Large amounts of time, work and money go into generating web traffic for professional services firms. Once a new user lands on the website, it is vital to quickly funnel them into the most appropriate area of the website to convert them from a lead to a customer. Well, designed website navigation is a fundamental piece of this web design and marketing strategy, but often the most efficient way to convert website leads is through well designed and well-placed calls to action. In the purest form, a call to action is a button or link requiring the user to take action to travel to a new page, download a file or complete a web form. For a call to action to stand out and perform a little design effort can go a long way to increase conversion rates on professional services websites. A surefire way to attract new web users and prospective clients is to actively write engaging blog posts discussing trends and current events in the professional services industry. Beyond the user experience and engagement benefits, creating high-quality, consistent blog posts offers excellent social media marketing opportunities and search engine optimization benefits. Another effective way to add high-value web content and relevance to a professional services firm website design is case studies. Offering in-depth case studies offers prospective customers insight into how the firm works and what sort of results they can expect should they become a client. Perhaps the most effective method of content marketing for professional services firms is gated content or featured resource downloads. These documents are typically highly valued and proprietary information that is shared with prospective customers after they’ve completed a web form sharing their personal contact information allowing the firm to marketing their services to them via email newsletter or drip campaigns. Social media is a fantastic tool that professional services firms can use to build their digital brand and amplify their content marketing. When social media channels are used to share blog posts, case studies and landing pages that feature resource downloads a professional services firm does not need to rely on organic search traffic only. Ensuring the digital brand is carried throughout all active social media profiles will help establish the brand image in potential customers minds. Every aspect we’ve covered in our web design best practices for professional services firms eventually plays a role in how effective the website’s search engine optimization tactics perform. Despite referrals or social media content marketing, the most effective and convincing way to convert leads into customers is organic search. Our Toronto web design and development team is well equipped to ensure all new website designs for professional services companies launch with the very best search engine optimization features in place. For a one on one conversation covering how our Toronto web design company can help your professional services firm take its marketing and web presence to the next level, please call our office at 416-901-8633. If you have a request for proposal or would like Parachute Design to prepare a formal plan for your professional services firm, we invite you to take a moment to review and complete our web design proposal planner. Need a Professional Services Firm Web Design Estimate?